Sanibel is home to several species of small mammals (rodents) both native and non-native. 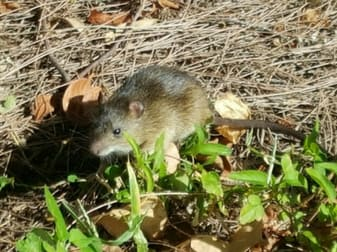 Sanibel is also home to the endemic Sanibel rice rat (Oryzomys palustris sanibeli) that is found nowhere else. Historically, they are known from the vast cord grass (Spartina bakeri) swales on the island. These habitats like others on the island are quickly diminishing on the due to succession to hardwoods. This succession or change of plant community is due to the human induced change of the fire regime on the island. Lack of fire has caused a reduction of open grassy swales that several species, like the Sanibel rice rat depend on. We monitor several swales using Sherman live traps, biannually (March and November), for the presence and abundance of Sanibel rice rats as well as hispid cotton rats. This long term monitoring program helps us to gage the health of the swale and also when water levels are at the correct level to capture them. Every captured native rat is weighed, sexed, and marked for recapture purposes.